Camp Altitude Gym, certified member of the Association des camps du Québec. To earn this seal of approval, Camp Altitude must meet a range of high standards that cover every aspect of camp, from staff training, to program quality, facility maintenance and emergency procedures. Once the camp has been visited by an A.C.Q. representative and the necessary documents have been submitted, the association’s board of directors decides whether to grant certification. 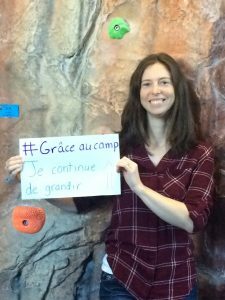 To find out more about what an A.C.Q.-certified camp means for you, visit the Association des camps du Québec website. Ciboulette, a.k.a. Chives, has a degree in recreation and has been part of the Camp Altitude team since 2016. Passionate about her field, she brings energy, creativity and structure to the camp. In her spare time, she likes to climb (obviously! ), play video games and read. She also has a seriously sweet tooth and loves desserts. We’re also looking for volunteers who want to help in our camp. If you’re at least 16 and would like to gain valuable work experience, email your resume and cover letter to emploi-job@altitudegym.ca for Sarah Dame-Larivière’s attention. You have questions our website left unanswered? Email us at campdejour@altitudegym.ca or call us at 819-205-0959 ext. 203!